Commercially made swimming pool heaters used to help warm up the water are often very expensive. Described here is a cheap and simple passive solar heater that I saw (and felt) working in Malaga, Spain. 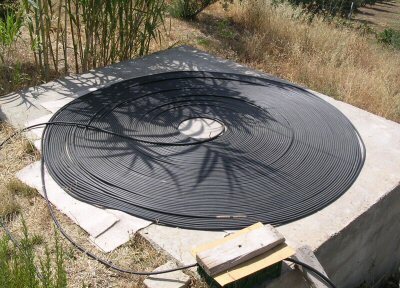 Roughly 300 m of 1/2" black plastic tube (as used on farms and industrial applications) was used to make a 70 turn flat spiral i.e. with side by side turns (this had an inside diameter ca. 50cm and a outside diameter of ca. 3m). 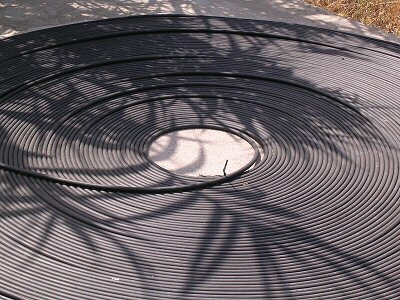 The spiral was laid flat on top of an insulating off-cut of carpet upon a concrete floor. The pool size was ca. 4m x 8x x 1.5m deep water. 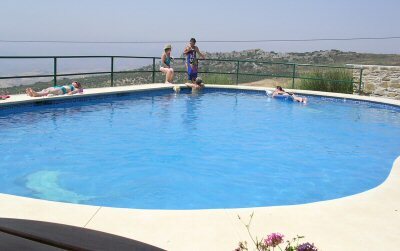 The water-in from pool might have been typically 25°C with no heating (other than from the absorbed sunlight straight into the pool). In the mid day / afternoon pumping at a slow rate through the spiral (ca. 10-20cl / sec) the water coming out the spiral was hot. This hot water was pumped to the opposite side of the pool and simply flowed in via the end of the pipe which dangled a foot or so above the water from the pool wall. A small 240V mains water pump was used to pump the water from one side of the pool through the spiral and back up into the other side (only a few meters of overall height change so you don't need much in the way of pumping power provided that you don't get air locks etc.). In typical summer conditions the spiral heater raised the water temp from ca. 26°C (going into the coil) to ca.39°C (coming out) over a few hours this raised the pool temperature nicely. How well it would work in other locations would of course depend on the ambient temperature, the size of the pool and amount of sunshine etc. The tube cost ca. €30, the pump ca. €70 so a complete passive spiral heater was built for ca. €100, perhaps 10 times cheaper than a commercial set up! Thanks to Robin for letting us stay at his beautiful villa in the Sierra de Alhama Mountains, near Periana, Malaga, Spain (ca. 800-1000m asl). You could try using a 12V water pump but power it with a solar cell panel. This will make sure there is no possibility of electrical shock (conducted through the water) and also one does not need to remember to turn off the pump at night!